As a financial advisor, you can apply this concept to provide more effective long-term care planning. For example, in a client meeting, you may talk about the what and the how of long-term care insurance (LTCI). Without understanding and communicating the why, however, everything else is irrelevant. If clients don’t understand the reasons to purchase, they will not buy a policy. 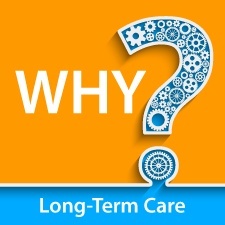 Why Do Your Clients Need a Plan for Long-Term Care? You cannot limit planning to just retirement or death. You must help your clients plan for old age. What if a client needs extended care? If no part of the retirement portfolio has been allocated to pay for health care costs, and if an illness lasts long enough, it will compromise the financial viability of a surviving spouse and the integrity of your client’s entire financial and legacy plan. So, how can you move from just talking about it to actually doing it? Allocating assets is something you do every day: You take an investment set aside for a specific purpose and move it into another investment set aside for the same purpose but with a potentially better outcome. You can use this same concept in your long-term care discussions with clients. It’s likely that some of your clients have set aside liquid investments for an unexpected emergency (e.g., potential health care issues). Why not take this “emergency” money and move it into another asset with a potentially better outcome, such as asset-based long-term care? Or, why not use a small portion of assets or dividends to fund a long-term care plan? Clients may think they have the ability to self-fund for this, but they often lack liquidity. A long-term care plan helps avoid invading principal or liquidating assets at below-market value. Once your clients have decided to make long-term care part of their financial planning, solutions will vary depending on whether they are cash-flow strong or cash strong. This may seem simplistic, but I think you will find it can serve as a useful guide. Cash-flow strong. Clients who are cash-flow strong include pre-retirees (age 55–65), younger professionals with high incomes, plus those retirees who want to refocus required minimum distributions (RMDs) or who have more-than-adequate retirement income. These clients can comfortably pay $2,500 to $10,000 per year in long-term care premiums and should consider regular LTCI in addition to multi-pay linked-benefit policies. A traditional LTCI policy that has a $6,000 monthly benefit, a three-year benefit period with 3-percent compound inflation, and an annual premium of $5,000. At age 85, each spouse would have more than $500,000 available for care expenses that otherwise would have to come from assets or income. A coinsurance-type strategy with lower benefits, such as a $4,500 monthly benefit, a two-year benefit period with 3-percent compound inflation, and an annual premium of $3,000. Many linked-benefit carriers offer multiple-pay options that allow a client to fund a policy over the course of 2 to 10 years. For example, a retired 65-year-old man with RMDs to be repurposed could purchase a multi-pay linked-benefit plan. Paying $15,000 per year for five years would give him a total long-term care pool at age 85 of $270,000, with a monthly benefit of $4,200. As an example, a 60-year-old married woman could reposition $100,000 from a maturing CD into a life insurance policy. At age 85, her benefit pool would have grown to $715,000, providing a $9,400 monthly benefit to last six years. Whatever the solution, keep in mind that most policies include a care coordinator who provides concierge service by developing a plan of care, helping to hire the right people as caregivers, assessing the home for safety, and recommending facilities. The carrier sends checks every month to pay the cost of that care. In 2014 alone, insurance carriers paid $7.85 billion in claims. Your clients might focus on the premiums rather than the benefits of owning a policy. Your role is to help them understand the why—the leverage, tax advantages, instant liquidity, and professional care coordination that insurance affords them. You can also remind them that at the time of claim, a long-term care policy becomes priceless. What long-term care solutions do you regularly recommend to your clients? What strategies do you use to highlight the importance of long-term care planning? Please share your thoughts with us below.